In this new edition of the groundbreaking Ethics for the Practice of Psychology in Canada, content is both revised and expanded. 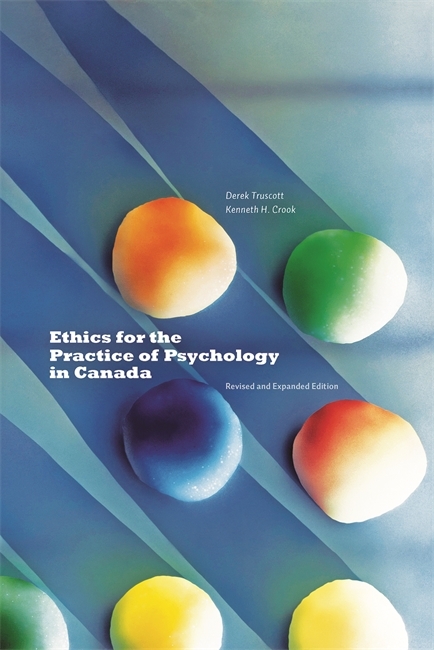 Continuing to fill a vital need for a Canadian textbook, the authors focus on major ethical issues faced by psychologists, including obtaining consent, protecting confidentiality, helping without harming, providing services across cultures, promoting social justice, and conducting research, while incorporating the Canadian Code of Ethics for Psychologists (2013). Each chapter includes case studies for practicing ethical decision-making, and a reflective journal to provide an opportunity for awareness on personal motives and biases relevant to making ethical choices. Written primarily for students in professional psychology graduate programs, the book is also ideal for anyone preparing to practice in Canada or for experienced psychologists seeking to maintain or enhance their ethical knowledge, skills, and integrity. Derek Truscott is a Professor in the Department of Educational Psychology, Faculty of Education, at the University of Alberta. He has published and presented extensively on psychotherapeutic processes, ethics, and standards of practice. Derek lives in Edmonton. Kenneth Crook (1960-2008) was a trial lawyer with a Vancouver law firm. He lectured and wrote extensively in the areas of insurance law, civil procedure, and medical malpractice. "The authors' style is concise and precise, yet not simplistic. They manage to capture the complexity of ideas, issues and situations while retaining brevity and clarity...While readily evident as a useful teaching tool and textbook, Ethics for the Practice of Psychology in Canada should not be underestimated as an asset for practitioners. In recent research at the John Dossetor Health Ethics Centre on the moral distress of mental health practitioners, we have learned that psychologists can feel very alone when internal and external barriers constrain their attempts to practice ethically. Having this book upon the shelf may provide relief for the lone psychologist. It brings a strong sense of the values expressed by the Canadian psychological community. It is a substantial resource.